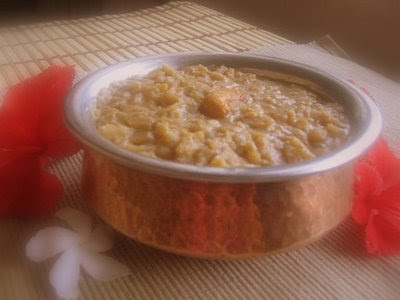 Pradhaman is an important item of Kerala Cuisine and a 'must served' one for "Ona Sadhya". 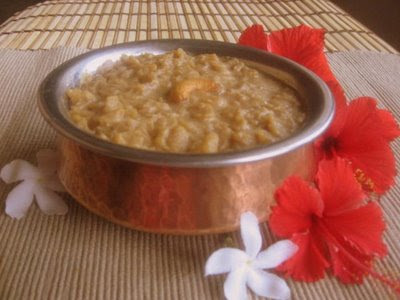 The pradhaman here is made using ADA as the major ingredient, known as Sarkara Ada Pradhaman. Formerly I used to make ada by soaking raw rice, dry grinding it, making into a batter, pouring in a plantain leaf, spreading, rolling and tying each of the strips and steamcooking them;again cooling the strips and peeling them carefully, sprinkling cold water and tearing them into tiny bits.I had made the pradhaman you see here, following this method.Well, this is supposed to be the exact traditional way of preparing them, definitely making the recipe elaborate as these pictures would explain!. 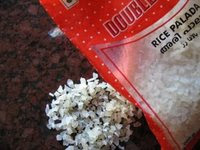 The readymade ada packets in the market serve the purpose equally well.Most of the brands make ada using "maida" as the major ingridient.So it is important to mak e sure that the pack you buy is of made using "Rice", instead(press one of them lightly which crumbles easily and not hard).As a result of the above 'experiment', I found 'Double Horse' brand Ari Palada, the best. Jaggery-2 medium balls / 350-400gms. Coconuts-2 medium-or to yield 6 grated cups. 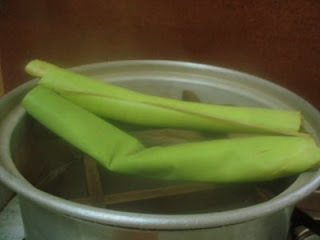 1.Wash Ada and soak in hot boiled water.Cover with a lid.Keep aside for 20 minutes. 2. Meanwhile prepare the coconut extract using minimum amounts of water.The "first milk" should be of 2- 2 1/2 cups.The thin milk or the 'second milk'(secondly extracted from the same molasses)of 3 cups.Reserve the mass of coconut shavings to extract 3rd milk, if necessary, towards the end. 3. Crush the jaggery balls into smaller pieces and make the syrup, by boiling just half a cup of water, for 10-15 minutes till it turns slightly thicker (almost the consistency of honey). 5. Add the ada, now turned soft, after draining the water completely,to the utensil containing the jaggery syrup.Mix them well, carefully without breaking the ada and adding ghee at this point to avoid sticking together.Let the ada absorb the sweetness well. Simmer till it reduces to three fourth. 6. Add the second milk of coconut and simmer for 10 minutes on low fire. 7. Add the cardamom powder to the 1st milk of coconut and pour in to the wok.Simmer till it just boils or for 2 minutes.Do not boil for long to avoid curdling up. 8. Pradhaman must reach a semi thick consistency by now.If its too thick, add coconut milk, which you can prepare again(the thinnest 3rd milk) from the same coconut shavings after the extraction of the 2nd milk. Again,the pradhaman tends to get thicker, once it is cooled down to room temperature.So do bear this in mind,while checking the consistency while removing from fire. 9. Remove from fire.Addition of golden fried cashews and raisins (in ghee) is purely optional as the original or the traditional recipe is devoid of the same. 10. "Sarkara Ada Pradhaman"can be served Hot or Cold. Note: Originally, as the recipe, the ada is sunken and the liquid part is what is seen, superficially. Attempting to bring out the ada, the liquid part of the pradhaman was drained, for the pictures, for a better understanding, here. Wishing you all a Very Happy Onam!.. A happy Onam to you! have a wonderful onam this year! 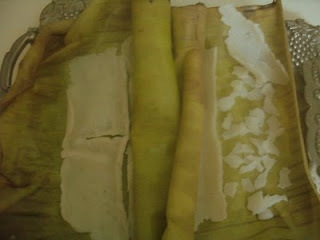 Happy Onam..Love anything with jaggery.love the last steaming pic. True. An Onam sadhya isn't complete without a pradhaman. Just perfect. Btw, Double Horse products are generally very good, I've found. 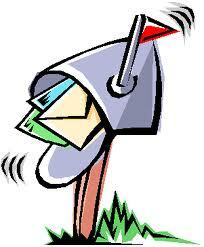 I have been a silent reader, enjoying your pictures and recipes. You pay a lot of attention to detail, which definitely makes the mark. Thank you for all your efforts. Good job. my favorite!never tried my hand at this ......will try out ......and let u know ! hope you had a gt onam! Wow! nice to note that, Karthik..I don't have a good mallu restaurant even for an eat out! :(..thanks for the wishes..
:D.. He he certainly not, jyo it was a long time, pending recipe..
Nandu, hope you are settled in your new place :)..thanx for visiting..
To be frank I had a very dull Onam this year..since hubby was away..cooked up something for children and lazed around watching spl programmes on TV.. I should admit each and every comment, out here, had made my day! :D..
Ada pradhaman looks good. however, I don't think the readymade ada can hold a candle to the taste of the authentic, home made ada. Though time consuming, I think it tastes much, much better. the sarkara pradhaman looks so yummy, am sure you must have had a good onam feast. 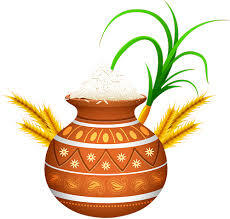 Belated Onam wishes to you Bharthy and Thanks for sharing such an authentic dish with all of us!! 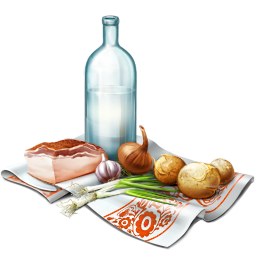 Hey...great blog!Lots of special recipies ...pics are amazing too!! happy belated onam to u too bharathy...urs ada pradhaman is divine..itsrich and creamy ...tempting pic..
Hello Bharathy How are you doing there.